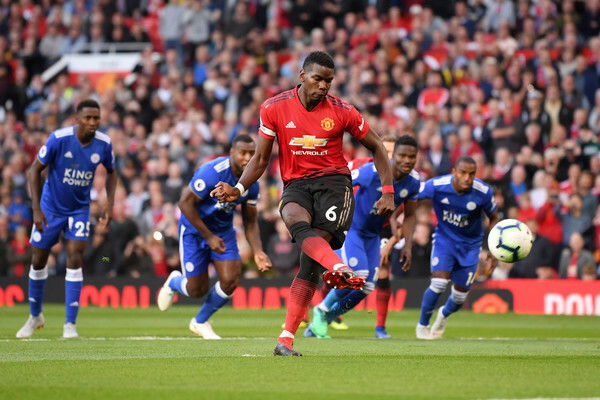 Paul Pogba and Luke Shaw were the stars of the match as Manchester United beat Leicester City 2-1 in the first game of the Premier League season. Pogba who has been linked with a move to Barcelona from Old Trafford was a surprise starter as he had only returned for training four days ago, having won the World Cup with France about a month ago. The red devils started the match on the front foot at, United won a penalty in the second minute when Daniel Amartey handled Alexis Sanchez's deflected shot. Pogba scored from the resulting penalty placing the ball in the top-right corner to beat Kasper Schmeichel. Luke Shaw then netted the first senior goal of his career to make it 2-0 with a brilliant finish after controlling Juan Mata's long pass. Leicester city brought on Jamie Vardy who scored a late consolation with a header after Ricardo Perreira's cross came off the post.